LINCOLN, Nebraska, January 22, 2013 (ENS) – Today Nebraska Governor Dave Heineman approved a new route through the state for TransCanada’s Keystone XL tar sands pipeline, which avoids the environmentally-sensitive Sand Hills region. The governor’s approval of the controversial pipeline is one of a series of events that will lead to a decision by President Obama whether or not to grant a Presidential Permit for the pipeline to cross the Canada-U.S. border. Governor Heineman notified President Barack Obama and Secretary of State Hillary Clinton of the accepted Nebraska route by letter today. The governor’s approval comes after his review of the final evaluation report from the Nebraska Department of Environmental Quality and is the last step in the re-route review process established by the Nebraska State legislature. The approved re-route now becomes part of the project’s Presidential Permit application with the U.S. Department of State, which was filed by TransCanada on May 4, 2012. The proposed pipeline would transport diluted bitumen extracted from the tar sands of northern Alberta to terminals in Steele City, Nebraska. TransCanada estimates that Keystone XL will cost US$5.3 billion to build and will support the creation of 9,000 jobs on the American portion of the pipeline and about 2,200 on the Canadian side. The projected in-service date for Keystone XL is late 2014 or early 2015, subject to approval of the company’s Presidential Permit application. Environmentalists point out that the pipeline route approved by Governor Heineman still goes through the Ogallala Aquifer, a water source for millions of Midwestern families. Nebraska landowners, farmers and ranchers and other Americans who care about clean air and water, will continue to fight the pipeline, says Jane Kleeb, who heads the pipeline protest group Bold Nebraska. 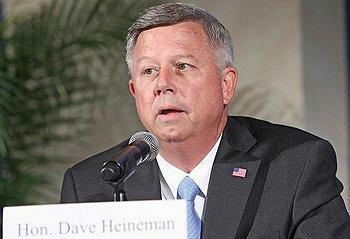 “Governor Heineman just performed one of the biggest flip-flops in Nebraska political history. He approved the pipeline route that crosses the Aquifer after he asked President Obama to deny the route that crossed the Aquifer,” said Kleeb today. 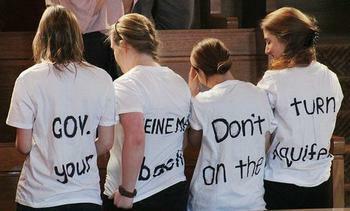 “Heineman turned his back on landowners and citizens who asked for an unbiased review of the risks of this pipeline. It is a shame when a politician these days can’t cross party lines even to stand up for our water and family farmers and ranchers,” she said. Pipeline protesters plan to make themselves heard in the coming weeks. “President Obama is our only hope now,” Kleeb said. Because the final decision will rest with President Obama, on February 17 environmental groups are planning to march in Washington, DC at the Forward on Climate Rally. The Governor’s letter to President Obama points out that the Nebraska Department of Environmental Quality final evaluation report made findings that emphasize economic benefits to the state and minimizes the possibility of environmental impacts. Among other assurances, the governor’s letter says TransCanada has promised to carry US$200 million in third-party liability insurance to cover cleanup costs for any incidents that occur in Nebraska. Construction of Keystone XL will result in $418.1 million in economic benefits and support up to 4,560 new or existing jobs in Nebraska. The project will generate $16.5 million in taxes from pipeline construction materials and is expected to yield up to $13 million in local property tax revenues in its first full year of valuation. Normal operation of the pipeline is expected to have no effect on ground or surface water quality or use along the pipeline route in Nebraska. In the unlikely event of a spill from the pipeline, impacts on water resources would be localized and would not impact the Ogallala Aquifer as a whole. TransCanada will implement a detailed Emergency Response Plan for Keystone XL and is responsible for cleanup, remediation and compensation related to oil released from the pipeline. The special conditions include burying the pipeline deeper underground, installing a higher number of data sensors and remote controlled shut-off valves and increased inspections and maintenance. TransCanada will also use special techniques to reduce disturbance and enhance pipeline safety near wetlands, rivers, residential and commercial areas, steep terrain and fragile soils. The physical and chemical properties of crude oil transported in Keystone XL will be similar to the light and heavy crude oils already being transported safely in pipelines across the United States. TransCanada promises to provide local emergency responders with Material Safety Data Sheets for products contained in the pipeline immediately in the event of a spill.